I made this for my family recently and they thought that it tasted even better than the restaurant’s dish. My mom kept raving about how good it was and how even she can’t replicate that Chinese restaurant “flavour” (known as “wok hay”). My brother even suspected that I had used MSG! 🙂 Just to be clear, I never use monosodium glutamate (MSG), because it is a neurotoxin and, clearly, you don’t need it to make great tasting food. 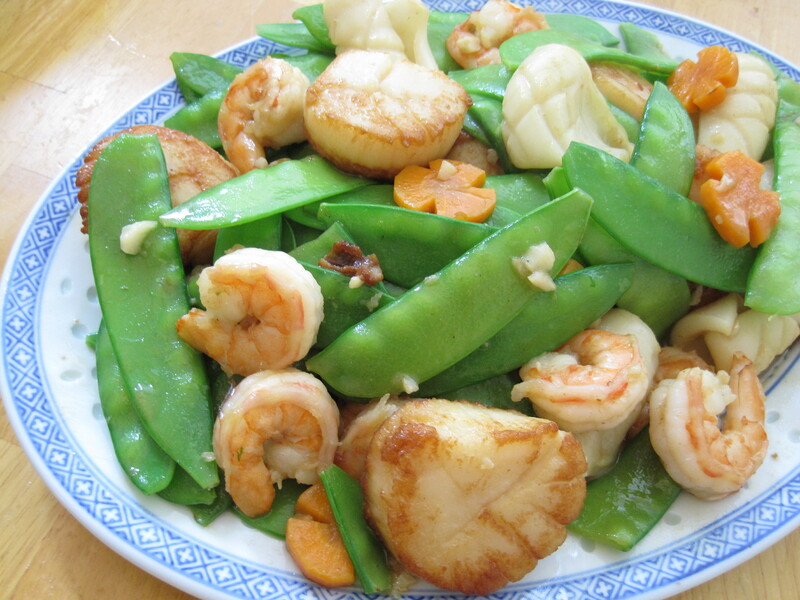 Stir fried snow peas with seafood (photo below) is a dish commonly found on the menus of Chinese restaurants. At Magic Wok, one of our favourite Chinese restaurants in Markham, they serve this dish in a basket made of deep fried, shredded taro. I am on the look out for the properly shaped Chinese wire strainers, so that I may one day make those baskets too. 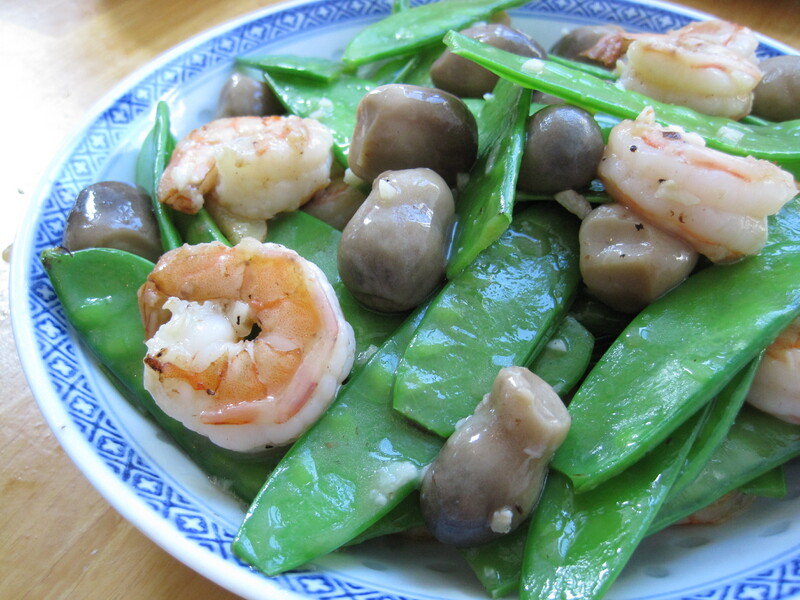 Alternatively, you could make a simpler and quicker snow pea and shrimp stir fry (see the first photo in this post) by replacing the scallops and squid with 1 can of Chinese straw mushrooms that have been drained and rinsed. If you do this, add the garlic to the wok at the same time that you add the ginger and shrimp. Then add the Chinese straw mushrooms at the same time that you add the snow peas. I love Chinese straw mushrooms and they make a great addition to any stir fry. makes 6 to 8 servings (this recipe halves well); Note: Alternatively, you could make a simpler and quicker snow pea and shrimp stir fry by replacing the scallops and squid with 1 can of Chinese straw mushrooms that have been drained and rinsed. If you do this, add the garlic to the wok at the same time that you add the ginger and shrimp. Then add the Chinese straw mushrooms at the same time that you add the snow peas. In a small bowl, mix together the water, shaoxing wine, sesame oil, corn starch, a pinch of coarse salt, and a few dashes of ground white pepper and set aside. Rinse and pat dry the squid body. Then cut it open by making a vertical cut through one side of it. Open up the body, lay it flat, and make shallow diagonal cuts across the inside of the body in a criss cross or diamond pattern. Then cut the body into a few, even sized, rectangular shaped pieces, approximately 2″ x 1″. Rinse and pat dry the scallops. Add a light sprinkling of salt to both sides of the scallops and set aside. Reheat the wok over high heat before lightly coating the bottom of the wok with oil. Swirl the wok so that the oil coats the bottom half of the wok. Then when the oil is hot, add the squid. Stir fry the squid until it curls up and turns white. Before it cooks all the way through, add the ginger and shrimp. Stir fry until both sides of the shrimp just start to turn pink (this will take seconds). Before the shrimp cooks all the way through, add the garlic and carrots followed by the snow peas. Give everything a few stirs and then add the sauce. Stir occasionally until the liquid has evaporated and the snow peas are tender but still crisp. Adjust salt to taste and gently stir in the scallops. Dish out and serve immediately with white rice.